UPDATE - please scroll all the way to the bottom to ensure that you read the comments left by James Dellow and Joe Gollner, they both add considerably to the conversation. Back at the JBoye09 conference in Philadelphia in May, Eric Hartman introduced me to the creation of TIMAF - The Information Management Framework, and asked me if I wanted to write an article for their publication, something which due to the new job, I have still not got round to doing ! However TIMAF founding contributors Eric and Bob Boiko presented their Basic Principles Of Information Management at the conference, and Eric started a discussion on the TIMAF LinkedIn group. IM is there to help people ‘talk’ to each other. Generally speaking, I don't have any issues with principles 2 to 5, but it would not be overly dramatic to say that I do not just disagree with principle #1, but I dislike it , with a passion! (as anyone reading my comments in the LinkedIn group will see). Possibly in a fit of pique, on the LinkedIn discussion I promised Joe a full 'rebuttal' of his position - yes, ever so slightly regretting that term of phrase now..... I am not sure if I am actually academically equipped to rebutt anything written by Joe, but I am going to use lack of time (and energy - noticed how I have not posted for a while?) as my excuse for not deconstructing Joe's article piece by piece. Please do click on the link above and read it in full, Joe has obviously got a lot of experience in 'content management' and publishing. Instead I just thought it would be easier to provide my reasoning why as to why I really don't like "Information is communication" - and provide some definitions and a working theory of my own, especially as we have recently had a very similar conversation in the office; "what is the difference between document management and content management?" Both Joe in his post, and some of the responding comments mention "Working Knowledge" by Tom Davenport and Laurence Prusak - I am a 'fan' of the rather practical definitions given in this book and they are the ones are generally refer to, and starting at the bottom of the DIKW pyramid, they suggest data is: "Data is a set of discrete, objective facts about events". So a datapoint in a dataset of sales figures, i.e. that you sold $6 million worth of hockey kit in the first quarter, is an actual, substantive fact, but it is not information yet. Well sure it is you say, knowing that you sold that much in a certain period is in fact useful information. Not really - its simply collected data. To turn the data into information it needs to be processed (by a computer or a human brain) in a contextual manner. Is $6 million more than the same period last year, or less ? does it consist of more items, or less? Is the profit margin greater or less? Is it more than our competitors or less? By merging it with other data, by disagregating it, by collecting further data to back it up, by extrapolating it, or exploring the effects of the data in various models, we are contextually processing the data and adding value to it. Some data needs more processing and polishing than other data in order to expose its intrinsic value. This is linked to IM basic principles #2 and #3 - the same information may have more value to some target audiences than others, and depending on that target audience and the intrinsic value of the information, any transactions involving that information, including communicating it to others may increase its overall value. This leads us back to DIKW, Data -> Information -> Knowledge -> Wisdom. I believe good information management is an absolute necessity for a knowledge management enabled organization. Joe suggests in 'The truth about content' post that content is a nebulous concept, one that surrounds data, information and knowledge. However now its my turn to offer a more simplistic approach. I consider content to be "unstructured information" as opposed to "structured information". Structured information is that which can be built up from data in a structured manner, synonymous to the rows and columns of a database, for example that which is kept in RDBMS based applications such as a CRM. It is information and not simply a collection of data because it can include many data points from different data sets, metadata and other contextuallising elements brought together and processed to "paint a picture" of me as a customer. Each category spawns its own 'management' system - so we have Electronic Document and Records Management Systems (EDRMS), Digital Asset Management Systems (DAMS), Web Content Management Systems (WCMS) etc.... the acronym soup is endless ! Some vendors will tell you they sell "Enterprise Content Management Systems" (ECMS) which manage all unstructured information - but I prefer to think of ECM as a strategy, rather than a single product. Click on the diagram for a bigger more readable rendition. There is always a bit of an issue of scope (or 'territory' if you like) with management concepts. Information Management is a broad concept, so it is tempting to make it *everything* when it overlaps with other management themes, like communication. However, I'm not a fan of the DIKW model either. I think this is far too linear and falls into the same trap as IM being all encompassing whenever bits (digital or otherwise) are exchanged. BTW You might enjoy the article I wrote back in 2006 about KM vs IM, and the role of technology in KM - Knowledge Management: How to separate the wheat from the chaff (PDF, 108KB). I enjoyed your post and all the more because it has me thinking. This usually leads to my creating impenetrably complex diagrams and even more monumental posts. I think a short summary, together with a reference to this post, should really find its way over to the TIMAF group - where there are plenty of lurkers who might just jump into the conversation. I too think that the basic principles have some way to go before they can be embraced. On the points you raise, I think that we are in sync on at least one point (there are more but I'll pick one) and that is I don't think that Basic Principle # 1 is workable in its current form. I guess I should have been more blunt in my contribution to the TIMAF discussion. I will confess that I did however suggest that information is the transactional stuff of communication. From this perspective, data becomes information when it is contextualized (as you suggest) and the critical, and defining, context is intentional (i.e., who it is being dispatched to - even if this is generalized - and why). In my definitions of DIK, this is why I am always sneaking the term "meaningful" into the equation - with meaning being irrevocably connected with intention. As I think about it, I am not sure we are all that far apart on this matter but this may be because I have evolved a private vocabulary for this subject (and this would not be the first time). On the DIKW pyramid, I have explained my view on this in a whitepaper called "The Anatomy of Knowledge". I try to make a qualified use of it - with this including the abject refusal to discuss "wisdom" at all. I will also take a look at James' paper and I too am happy for the reference. 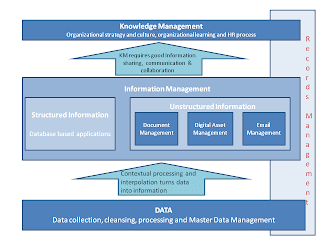 While on the topic of references, a colleague once pointed me to "Information Space" by Max H. Boisot (See the I-Space Institute) as a way to refute some of the definitions I put forward in my above-cited whitepaper on Knowledge Management. I was already familiar with Mr Boisot's works and, as a matter of fact, I find them to be the most comprehensive and exhaustively elaborated that can be found on the subject of data, information and knowledge. Even while I take my hat off to Mr Boisot, I must say that I don't find there to be too great a difference between his more complex definitional model and my more terse (and more specifically bounded) definitions. Each of these contributions, with yours included, are essays in the proper sense - attempts to bring a subject into a better state of shared understanding - and it is the collection of these efforts that is ultimately valuable. I do really like your emphasis on meaning and intention - I shall definitely use that in future discussion.